Saturday 20 February 2010, Harmony Church, Oaklands School Hall, Cunningham Place, Hallswell, Christchurch, New Zealand. Concert starts at 7.30 pm entry free, offerings will be taken (suggested $10). From 2-5 pm there will be a worship seminar for which a $20 admission applies. 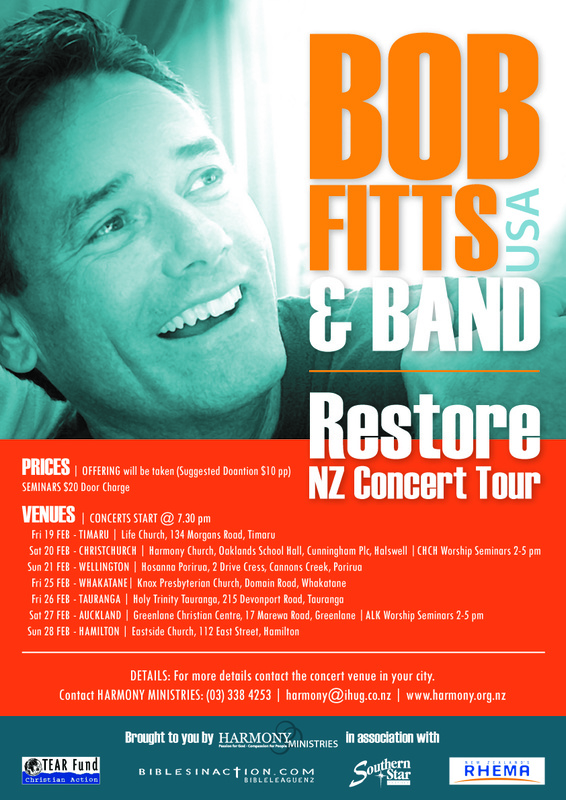 Bob Fitts has been writing songs and leading people in worship since the early 1970s when many students on his Corona, California high school campus met daily at lunch to worship and pray together. After high school, he attended The Melodyland School of Theology in Anaheim, California and graduated with a Bachelor of Arts in Christian Ministry. At the same time, he served as youth pastor and church worship leader in Riverside, California. Bob and Kathy met during high school and were married in 1976. In 1981, with their first child Andy, they moved to Kailua-Kona, Hawaii to work with Youth With A Mission and its teaching campus, The University of the Nations, until 1993. During that time, Bob led several Discipleship Training Schools (DTS) and in 1990 pioneered the School of Worship, which is now presented in several countries around the world. He still has the privilege of speaking in those schools from time to time. Bob and Kathy continue to make their home in Kailua-Kona, Hawaii and attend Solid Rock Ministries. Their four children, Andy, Ryan, Garratt and Mikella are now grown, giving Kathy the opportunity to travel with Bob around the world and fulfill their life’s calling to take Jesus’ healing to the nations. This entry was posted in MUSIC, RELIGION & SPIRITUALITY and tagged Bib Fitts, Harmony Church. Bookmark the permalink.